It’s officially the girliest thing I have ever made, I present Rose Water Lotion. I used argan, jojoba, sweet almond, and coconut oils along with mango butter, sea buckthorn and oat extract. Scented with rose water. It’s very light and silky lotion and has a delicate lingering rose scent. The first flowers from my chamomile cut to be dried, my tulips are beginning to bloom and it’s nice out today. 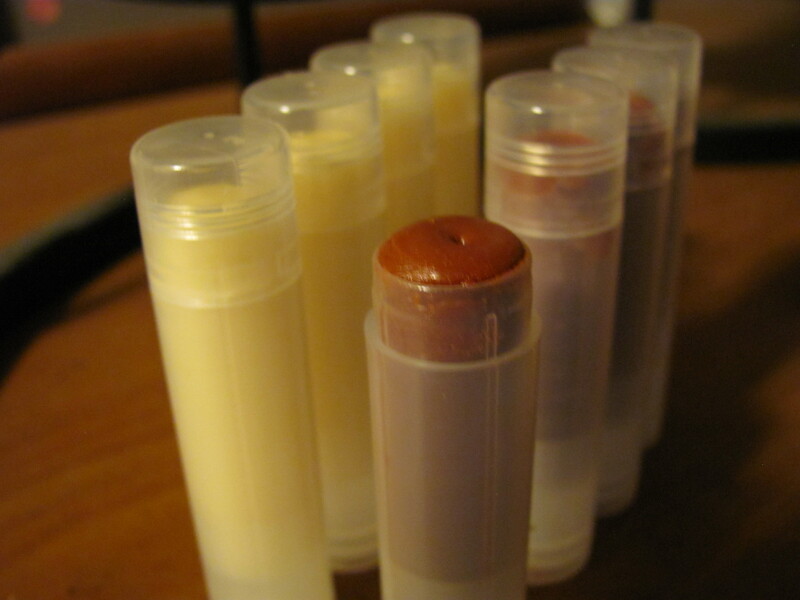 Somehow I have run out of lip balm? Is that possible? I guess the washing machine has gotten them all. Time to test my rose gold mica. Add coconut oil, candelilla wax and mango butter to a measuring cup, microwave in 20 second bursts until completely liquid. Add remaining ingredients and stir really well. Pour into lip balm pot, cool completely before putting lid on. Mango scented with Mango Butter, Moroccan Red Clay and Nettle Extract. I forgot to add the Lemongrass so it is unscented. Also used turmeric as a colorant. 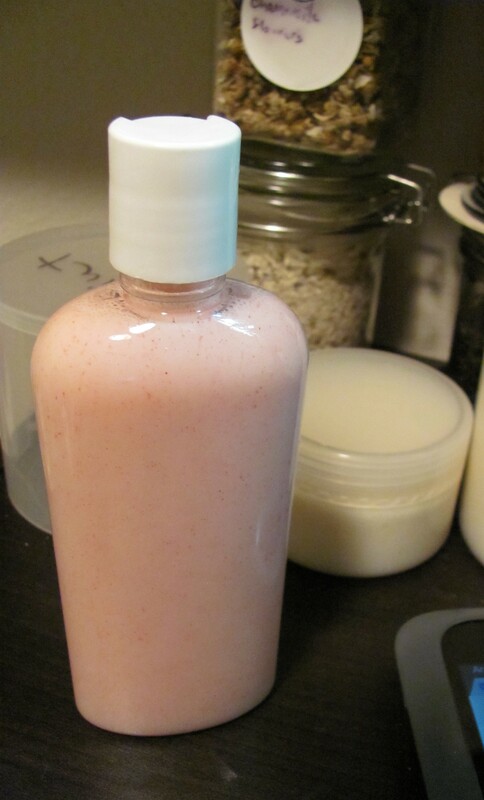 This is a mild scented Strawberry Lotion made from Distilled Strawberry Fruit. I only had a sampler size so I made this as a small single bottle recipe, It fit perfectly into a 4 oz bottle. In a double boiler (I use a measuring cup and a small sauce pan for this) gently melt together Mango Butter, She Butter, Meadowfoam oil, Emusifying Wax and Stearic Acid. Heat Distilled water in the microwave until near boiling, pour into mixing bowl and add melted butters and oils to distilled water slowly, whisking constantly. If your distilled water isn’t hot enough it will cause the oil mixture to partially resolify causing lumps. Whisk vigorously for about 60 seconds then slowly mix in Strawberry Essence and Vegetable Glycerin. Continue to mix for a few minutes then mix in remaining extracts Alkanet root and preservatives. Rest for a few minutes then whisk for a minute, rest and whisk, rest and whisk until there is no separation after resting. When completely emulsified pour into container of your choice and let it sit open for at least 4 hours before applying lid. I get mine ground up but not in a powder, it’s more like large coffee ground size. Add a tablespoon of the root to 3 tablespoons of carrier oil(I used Sunflower Oil) Seal it up in a jar and shake daily. After a week strain Root debris out of the oil and return oil to jar, Add another tablespoon of dried Alkanet Root to jar and shake daily. After a weeks strain root debris from the oil and place oil in a clean jar and seal until needed.